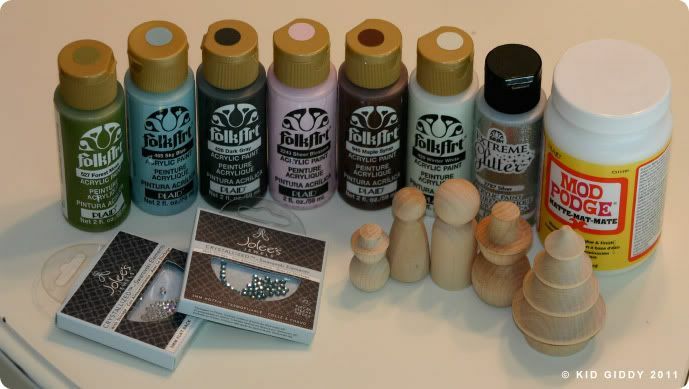 The Craft and Hobby convention is just days away! I've been scrambling to get things ready and spending much needed time with my girls and having a date night with my hubby! It's been a great weekend, but now it's crunch time and....time for a giveaway! Last year I went to the Craft and Hobby convention for the first time ever, and to celebrate all that I have accomplished in the past year...I'm giving away some Anna Griffin fabric and one of each of the patterns that I designed for her. These patterns debuted at the May International Quilt Market and I went to her booth and soaked up every bit of the sweat and tears that I poured into them! It was such a wonderful experience and I have truly grown from the opportunity! Thank you Anna! So who's ready? who wants to win?...here's what you need to do for your chance to win a prize! The Anna Griffin Decorative Fabric and Sewing Patterns GIVEAWAY! PLEASE READ ALL THE "RULES" BEFORE LEAVING YOUR COMMENT! thx! All patterns include the instructions and the printed pattern pieces. All materials needed to complete the project are not included, but are listed on the packaging. +Please include your top 3 choices if you win. I cannot guarantee you will get a prize from your top 3, but it just might help me in the random selection process. Thank you for understanding. This Giveaway will be open from today, Monday January 23, 2012 12:00pm EST until Wednesday Feb 8, 2012 11:59pm EST. Winner will be notified by email. You will have 24 hours to respond with the info so I can ship out your prize, or a new winner will be chosen. And click on the Kid Giddy Facebook update that mentions this giveaway and "share" it with your followers. It will show up as "1 person shared this" (or how ever many share it). Be sure to leave a message back here saying that you shared it and leave your facebook initials here for verification. So are you ready??? Go! Thanks for stopping by and entering my giveaway! If you have any questions about the giveaway you can click the contact me button up top and fire away! After you do make any one of these Anna Griffin patterns that I designed, please feel free to share your creations, by uploading a couple of my pics to my Kid Giddy Flickr Group! I just recently started the group, so I still need more company! 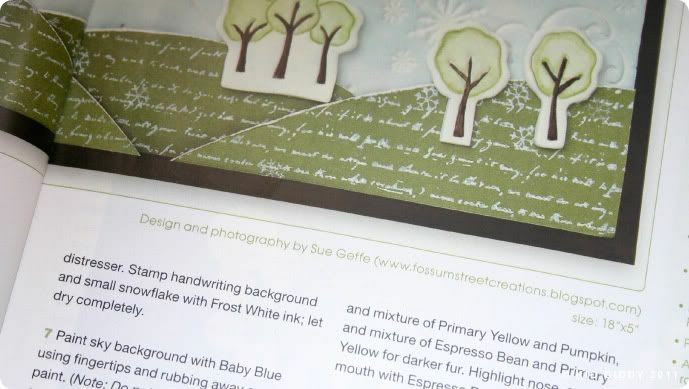 If you've made something using one of my designs, or tutorials, please post it to the group! Good Luck and have a great week! Be sure to check back (click that follow button over there, or subscribe to my RSS feed) to keep up to date on all my happenings! CONGRATS everyone & Thank you for entering. There will be more goodies on the horizon - be on the look out and check back often! I PROMISE!!!! When I was younger, I remember going to visit my Great-Grandmother at her house. (I was young - I thought it was her house, but many years later found out it was not her house but my mother's Aunt's house). For the sake of the memory, I still call it her house. I remember in the front room a little table, with a checker board painted right on it. It was a small round table, just big enough for the board and some chess pieces (again from memory). I've always had a love of chess since learning it, but honestly don't play it all that often. I can beat my husband any time while playing Othello, but he often check mates me in Chess! Regardless of wether I win or lose, I still love the game. I love the pieces and I love the challenge and strategies. When I went to visit my dad in Utah one summer, I went to his office at BYU and saw some chess pieces made from steel. There they were, lined up along the top of a desk or windowsill. They struck me as simple and beautiful, and I have wanted them ever since. 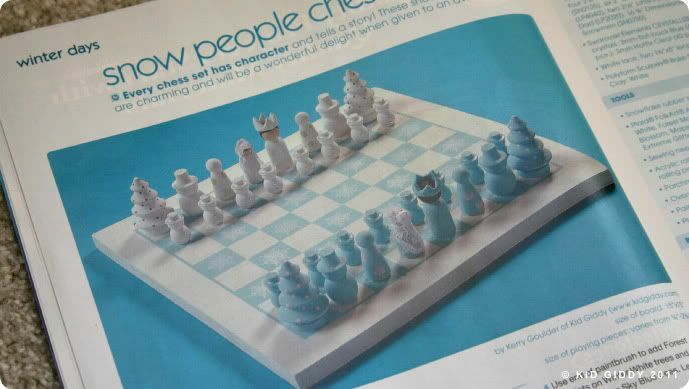 I don't have a machine that can turn a bar of steel into amazing chess pieces, but I had a vision of creating a kingdom of winter chess pieces with the wooden trees and snowmen that you'd find in any hobby store. I will be the first to admit that painting and stamping is not my go to medium, but once in a while I am smitten with an idea and must tackle it head on! 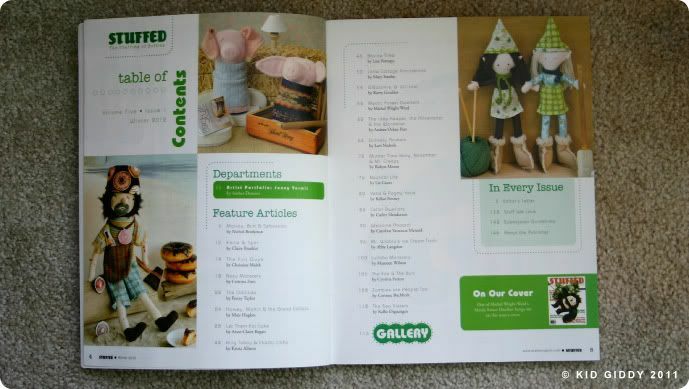 You can find all the information for this project in the current Feb 2012 Crafts 'n things Magazine! (You'll even see it on the front cover in the top corner!) I hope you enjoy making your own set! If you have children, invite them to help or let them make their own! Here's what you'll need!...I bought all of my own supplies and got all the wooden pieces from a place online called craftparts.com. (I was not paid to say that)! 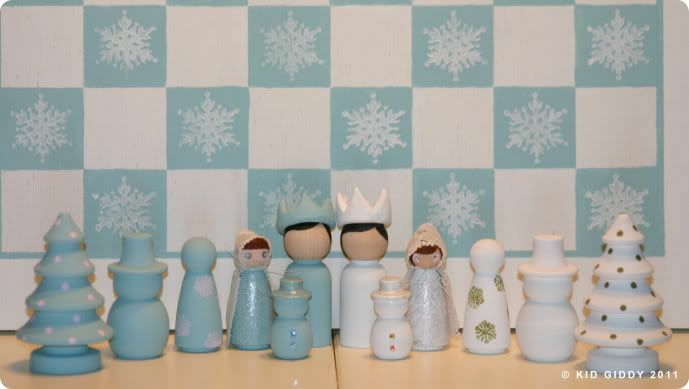 Since crafts parts is no longer selling the tiny snowmen, you can also try this other website. T-minus 5 days until I leave for the ever fun Craft and Hobby convention. Stress is high and there's still so much to do! Thanks for visiting, and it's almost time for that Anna Griffin pattern giveaway I mentioned last week! Be sure to keep your eyes peeled for that post! Have a wonderful week and come find me if you are attending CHA, I'd love to meet you! You can tweet me @kidgiddy to find me! I've waited forever to share this awesome news...and then when I finally could, one thing lead to another, and I got sick for 6 weeks out of 7! I've been playing catch up ever since. 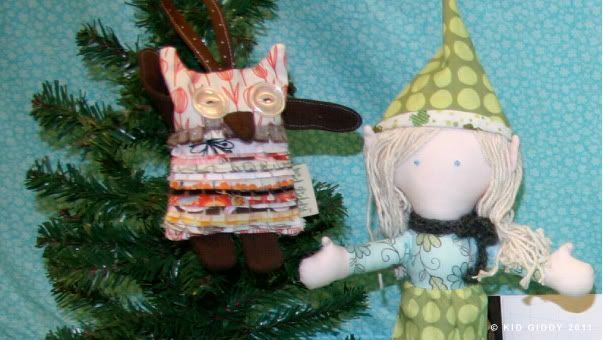 Some of you may recognize these little gnome girls from my Designer Showcase table last year at the Craft and Hobby Winter Show. And although that was their first "official" outing in public and away from their forest, their story goes much further back in time! 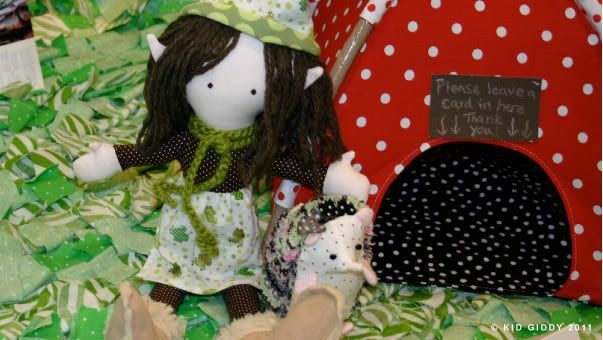 These Gnome girls were based off of my twin sister Sue and I! She has always had a love of Fairies and I have always loved gnomes and all things small, cute, and imaginary (but real - always real). I was so excited to submit these Gnome Girls (GNaomi and Willow) to be considered for the Winter 2012 issue of STUFFED Magazine and then almost missed the deadline thinking I could submit it via email. Nope. Not really! I frantically mailed them out over night at the last minute and they were still - miraculously - accepted for submission. I was beyond excited and hoped that didn't scar my reputation. Then a couple of months later I was in the car with my family (not driving) and was checking my emails. 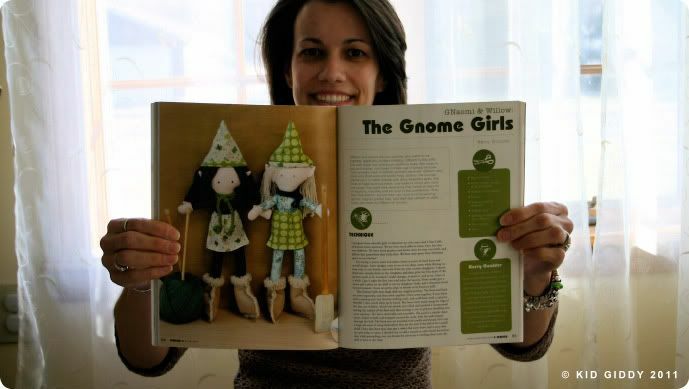 I got an email from STUFFED and found out that my Gnome girls were going to appear in the Winter issue! I was so excited I cried. 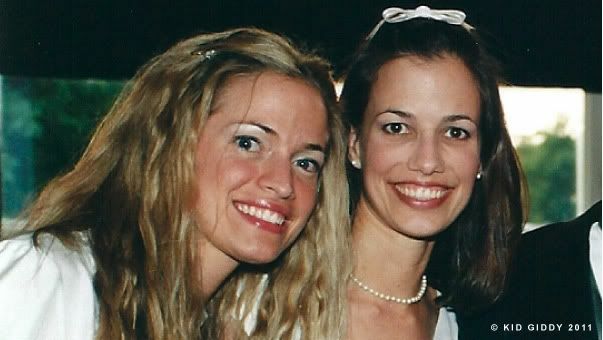 My daughters felt so bad that I was crying - until I told them why. Then they asked "well - why are you crying if you are so excited mommy"! Gotta love the things kids say! Excited just wasn't even a strong enough word for it! Eventually I received an email with a PDF copy of the spread to proof. Again - so excited. Now it was real. No matter how many issues or publications I've seen my designs in, a new one is still so exciting and even validating. That I must be doing something right! I haven't decided yet if I will offer this pattern in my first sewing pattern book or online in my Etsy shop. So stay tuned! It will be available at some point! I promise. 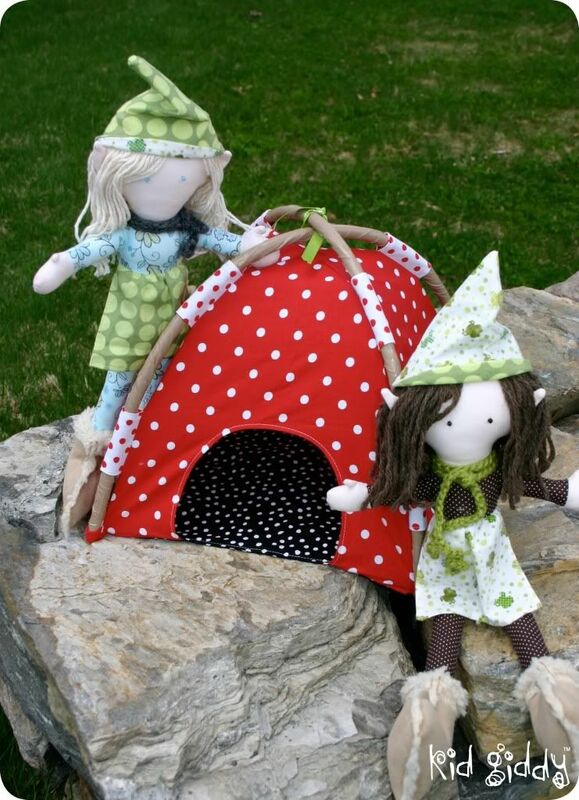 If you want to make Gnaomi & Willow's adorable tent, click this Mini Tent link to visit the Sew Mama Sew website, where it was a featured tutorial...for FREE! I love giving some things for free...I thought every little kid (and adult) should make a little tent like this one for all their imaginary (real) friends! It would make a great little house for a family pet too! 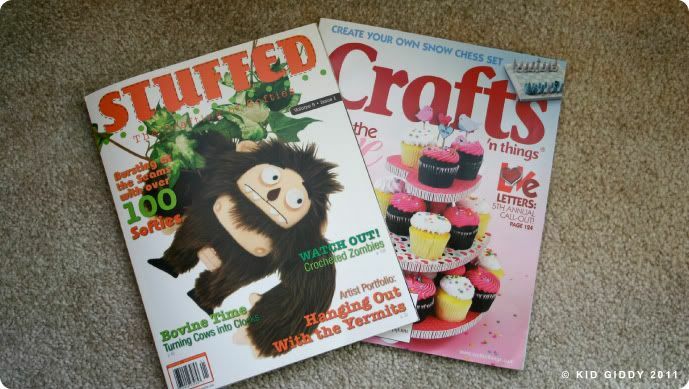 Thanks for stopping by my blog and for reading all my kid giddy news! I love what I do and love sharing it with all of my readers. I leave for this years Craft and Hobby Winter Show in just 10 days! So I have to get busy! 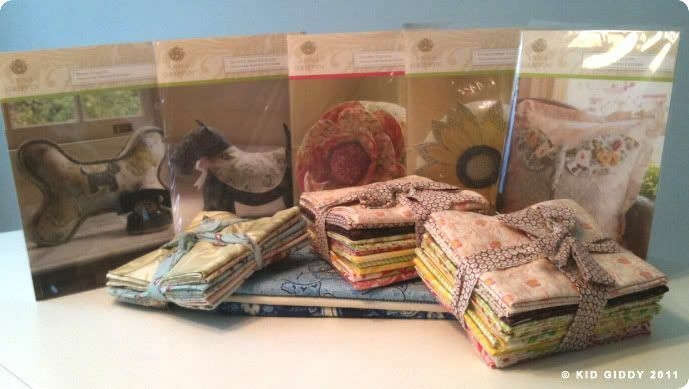 Keep checking back for more fun stuff and my Anna Griffin Fabric and Patterns giveaway! 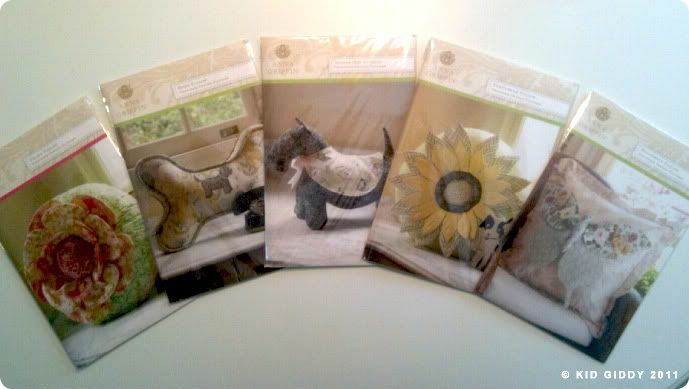 You know - these yummy (Butterfly, Sunflower, Peony, Dog Bone & Scotty Dog) patterns....that's right! 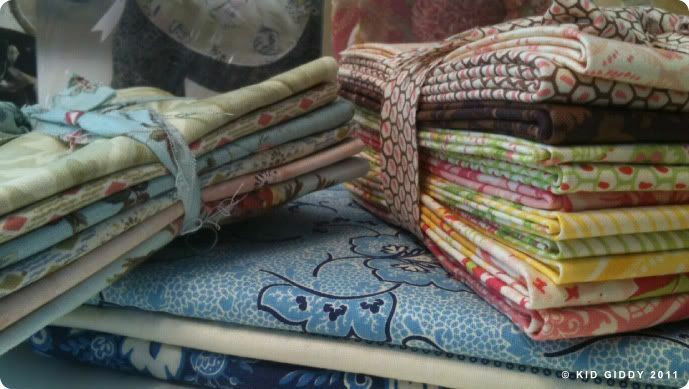 I have one of each pattern to dish out, and some awesome Anna Griffin fat quarter fabric bundles to some lucky readers! You won't want to miss it! Have an awesome day and a wonderful week everyone! 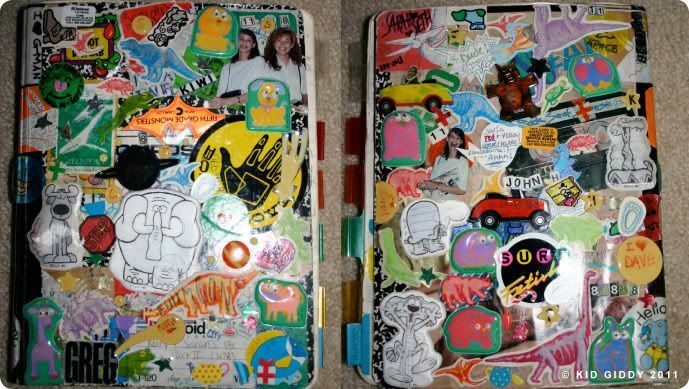 A few weeks ago I was digging through some of my old "memory" boxes trying to find something I wanted to show my girls and happened upon my childhood sticker book, my old journal calendar, and a notebook I shared back and forth between my high school friend Sarah (everyday)! They were so excited to see these treasures from my childhood and younger years and so was I! During this time of the new year, I try really hard to get back into the swing of journaling and being better about it, but I often overlook the value of it, and feel too overwhlemed by my to-do list. It almost always falls to the bottom of the list. I forget that it really can be so simple, and I'm grateful for these reminders of having "captured the moment". I'm reminded that journaling doesn't have to be a huge scrapbook, or a long old school, handwritten novel to write everyday. It can be so much more simple. 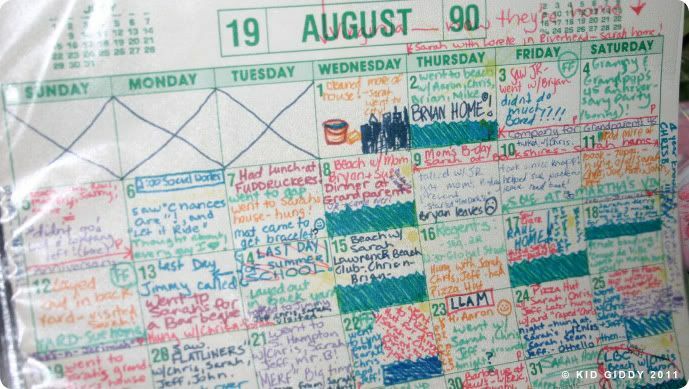 I found it so easy to write my daily doings on my calendar and love that I remember doing those things and drawing those wave doodles. I love reading this notebook between my best friend, and reading what our cares and worries were, and who we had a serious crush on! (lol!). 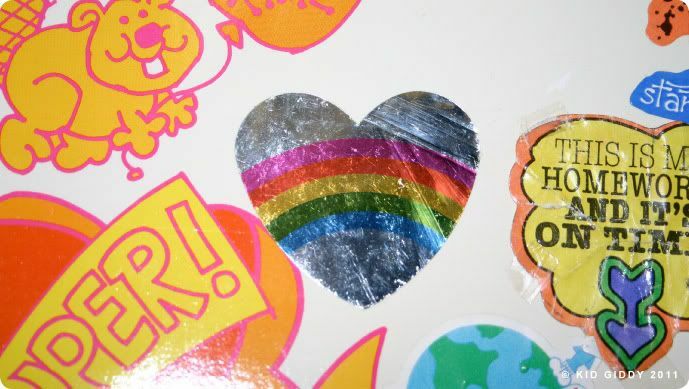 I love that everytime we traded it back and forth, we added a really cool or funny sticker. 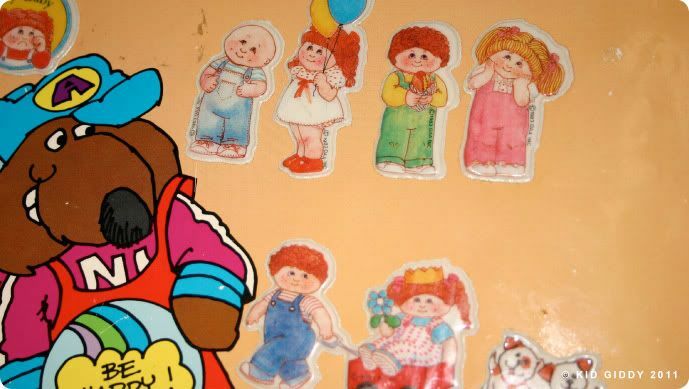 I'm going to do the sticker book with my girls. I will have them add a sticker on their journal every time they write in it! And hopefully at the end of the year, I will say that we went through a ton of stickers! I hope this new year will bring so much joy and happiness into your lives. And I hope that we might all find just a little bit of time to capture these moments, so in 20 years we can look back with a little more clarity. Happy journaling!